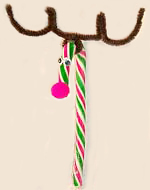 Bend the pipe cleaner in half and wrap it evenly around the candy cane so that the ends are facing up, and glue in place. Bend the pipe cleaner so that it looks like antlers. Glue the googly eyes next to each other below the pipe cleaner. Glue the pom pom on to the end of the hook part for the nose. Make enough for all of your friends and give them out for Christmas!